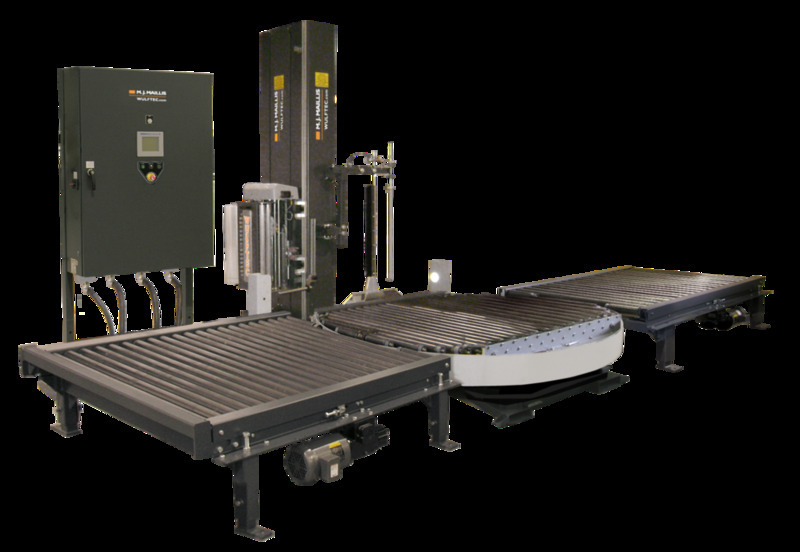 Neff Packaging Systems offers a full selection of automatic and semi-automatic stretch wrap machines to meet your specific needs, featuring Wulftec Machinery. The stretch wrappers serve a broad range of industries including: Airline, apparel, automotive, chemical, warehousing, food & beverage, lumber, printing and more. New and reconditioned machines are available. Product Description: This extra heavy-duty model offers exceptionally tough and accurate wrapping with Allen Bradley PLC with touch screen operator interface. This handles up to 50 loads per hour. Provides reliable performance and requires minimal maintenance. It comes with a 10 year warranty on the ring gear bearing drive. 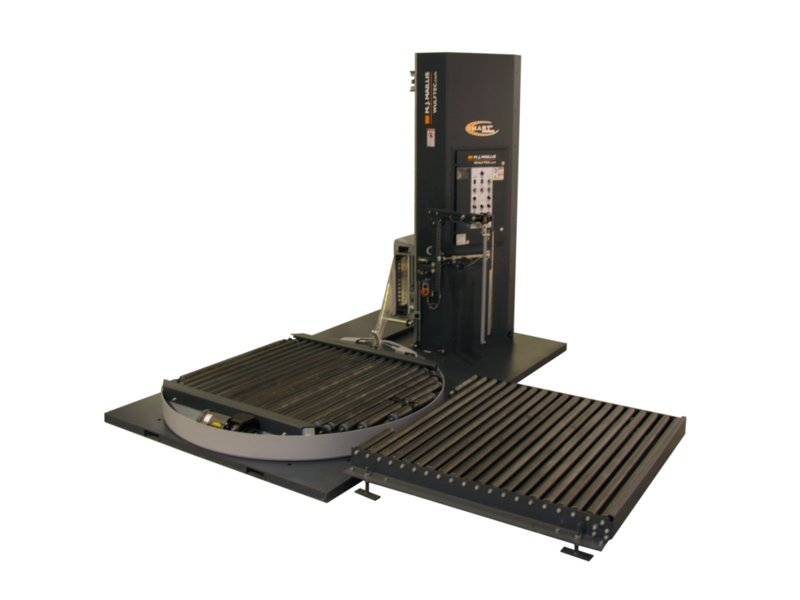 Product Description: Wulftec's fully automatic high profile, 5,000 lb load capacity machine. 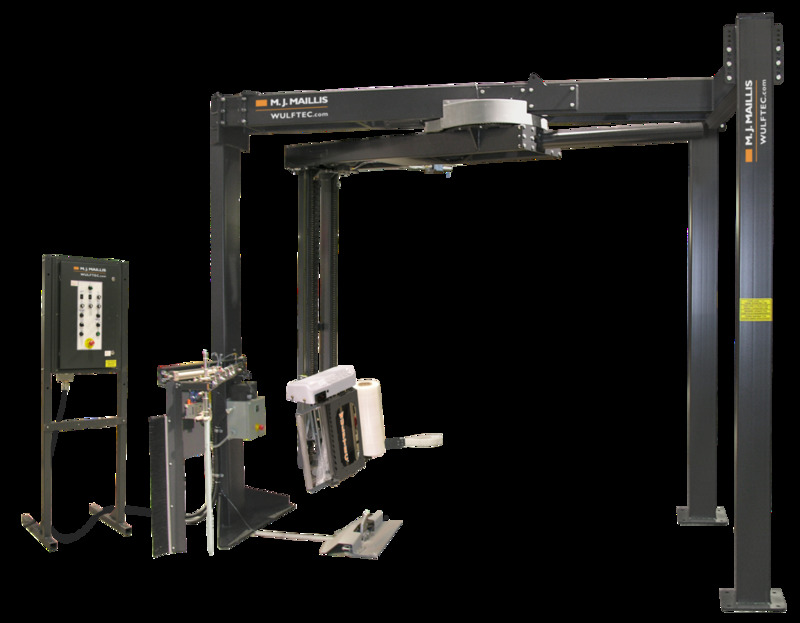 Product Description: Automated Twin Station Stretch Wrapper. Provides increased throughput and forklift efficiency - the driver never has to get off the lift! Has the ability to wrap and unload simultaneously! Product Description: Fully automatic conveyorized turntable with proven cut & wipe film treatment. Wrap 2" from conveyor for a secure load. 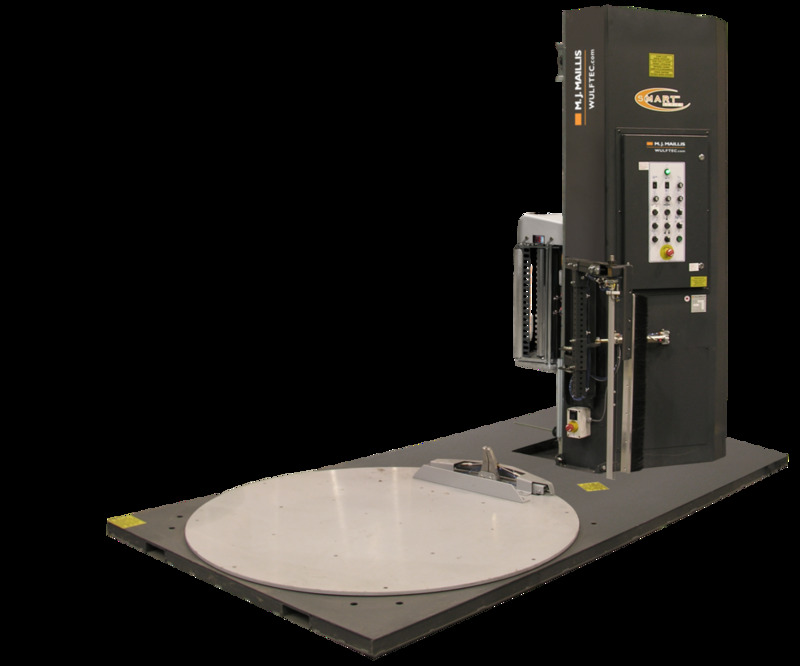 Product Description: Combo Arm Turntable for high-speed wrapping at 45 RPM or over 100 loads per hour! Product Description: Conveyorized automatic rotary arm with active counterweight. The best in-line overhead for all applications! Has unstable load wrapping capability and optional elevating clamp to allow banding. Product Description: Conveyorized automatic rotary tower stretch wrap machine. 15 RPM lets you wrap up to 60 loads per hour. Product Description: Automatically apply a banner wrap to your load and customize your load to include your product name or logo. 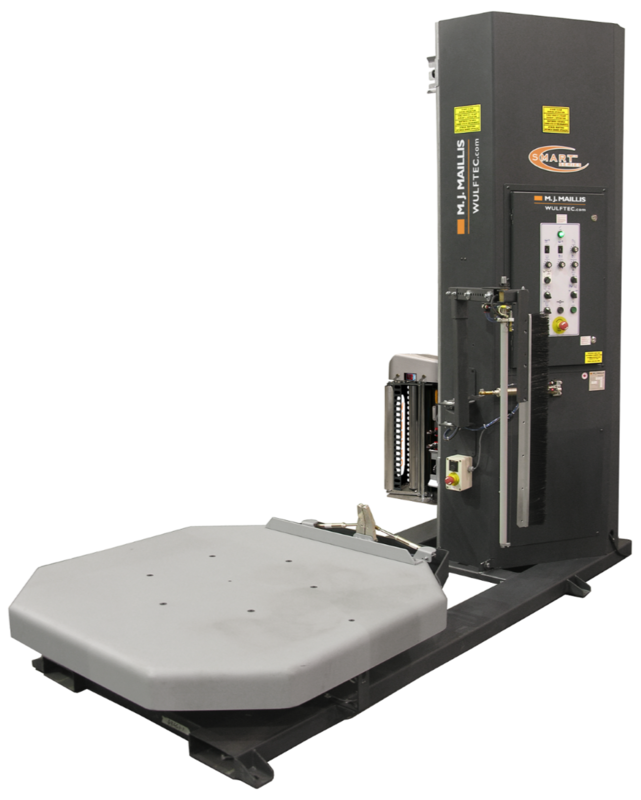 Product Description: Introducing the new WRTA-150, a fully-automated rotary arm stretch wrapper that gives you all the advantages of automation. Rugged overhead automation! Automation created with efficiency and affordability in mind. The proven Cut & Wipe system guarantees a tight wrap with no film tail. Product Description: Non-conveyorized heavy-duty, self-supporting 3-legged model. Processes up to 50 loads per hour with an unlimited load weight capacity. Provides a safe and reliable performance and a 3 year unlimited cycle warranty. Product Description: Designed with a powerful ring bearing gear belt drive system that allows steady operation at speeds up to 45 RPM. Horizontal automation! New, improved way to wrap doors, windows, carpets, textiles, lumber, copper piping, corrugated tubing, and more. Product Description: All conveyer types for any application; Roller, Belt, Pop-up, Multi-Chain, Transfer. Non-proprietary parts. Easy integration. Product Description: Automatically applies a poly top sheet to your load in the middle of the stretch wrap operation. The end result is a weather resistant package. Product Description: Advantage hand wrap is the original reduced gauge high performance handwrap. Quality performance due to thinner/stronger films and less neckdown. Provides excellent optics. Product Description: For most standard two sided cling applications, Linears Centurion is the film of choice. Great film for most any application! The recommended pre-stretch is 0 to 250%. Provides excellent containment and good cling. Superb optics and clarity. Product Description: For many of today's demanding loads Advantage Ultimate is the answer. This one-sided cling product sets the industry standard for premium films. Highest quality film on the market! It has 300% pre-stretch capabilities and improved load containment versus standard films. It is clear and quiet. Product Description: Berry Plastics high performance film for downgauging with better performance and clarity. Product Description: Berry Plastics high performance film for downgauging and smooth release for high speed operations. Product Description: Semi-automatic stretch wrap machine to fit any budget. Product Description: Neff Packaging and Wulftec can retrofit your existing stretch wrap machine with many upgrades including a new film carriage, control panel and many other features. Get the benefit of improved prestretch and EZ Load film with only a carriage change. Extend the life of your machine without a full replacement. Product Description: The high-profile octagonal turntable is ideal for small footprint. It's a part of Wulftec's Smart Series. Upgrade the base, control panel, carriage or tower depending on your changing needs. Has exceptional strength, durability and reliability. Comes with a 4 year unlimited cycle warranty. Easy set up. Product Description: Wulftec high-profile dual turntable stretchwrapper increases productivity. Part of Wulftec's Smart Series. Upgrade the base, control panel, carriage or tower depending on your changing needs. Has exceptional strength, durability and reliability. Comes with a 4 year unlimited cycle warranty. Easy set up. Product Description: Wulftec's high-profile standard base stretchwrapper is perfect for various applications. Part of Wulftec's Smart Series. Upgrade the base, control panel, carriage or tower depending on your changing needs. Has exceptional strength, durability and reliability. Comes with a 4 year unlimited cycle warranty. Easy set up. Product Description: Economic high profile turntable wrapper. The SMH 50 delivers results without costing a lot of money! Inexpensive and easy to operate! Has a 4000# turntable. Product Description: Wulftec's high-profile extra heavy-duty turntable stretchwrapper is critical for very heavy pallet loads. Part of Wulftec's Smart Series. Upgrade the base, control panel, carriage or tower depending on your changing needs. Exceptional strength, durability and reliability. Comes with a 4 year unlimited cycle warranty. Easy set up. Product Description: Wulftec high-profile split-base turntable stretchwrapper provides extra space around the turntable. Part of Wulftec's Smart Series. Upgrade the base, control panel, carriage or tower depending on your changing needs. Has exceptional strength, durability and reliability. Comes with a 4 year unlimited cycle warranty. Easy set up. Product Description: Wulftec's turntable cradle system for handling coiled loads. Product Description: Low-Profile octagonal base design ideal for small footprint. Part of Wulftec's Smart Series. Upgrade the base, control panel, carriage or tower depending on your changing needs. Has exceptional strength, durability and reliability. Comes with a 4 year unlimited cycle warranty. Easy set up. Product Description: Wulftec low-profile dual turntable stretchwrapper increases productivity. Part of Wulftec's Smart Series. Upgrade the base, control panel, carriage or tower depending on your changing needs. Has exceptional strength, durability and reliability. Comes with a 4 year unlimited cycle warranty. Easy set up. Product Description: Low-Profile standard base perfect for various applications. Part of Wulftec's Smart Series. Upgrade the base, control panel, carriage or tower depending on your changing needs. Has exceptional strength, durability and reliability. Comes with a 4 year unlimited cycle warranty. Easy set up. Product Description: Low-Profile oversized base for large loads. Part of Wulftec's Smart Series. Upgrade the base, control panel, carriage or tower depending on your changing needs. Has exceptional strength, durability and reliability. Comes with a 4 year unlimited cycle warranty. Easy set up. Product Description: Low-Profile standard base with 2' extension for extra space between the load and the tower. Part of Wulftec's Smart Series. Comes with a 4 year unlimited cycle warranty. Has exceptional strength, durability and reliability. Upgrade the base, control panel, carriage or tower depending on your changing needs. Easy set up. Product Description: Economy column mount design rotary arm for increased efficiency. Wraps up to 50 loads per hour. Economical high quality overhead wrapper! Has a 25 ring gear bearing drive. Highly recommended for high volume operations using pallet jack loading. Product Description: Self-supporting four legged design with 25" ring gear bearing drive/support. Has oversize load flexibility. Ideal for high speed, unstable loads or wash down applications. Product Description: Wultec's rotary tower cradle system for handling large coiled loads. Product Description: The ValueLine pallet wrappers are designed to meet the most cost effective pallet wrapping applications. The function of the machines is to easily and effectively wrap pallets with palletized goods on them and secure enough for transportation. It's ideal for low volume users in all industries. Easy machine set-up for first time users and simple and easy to use control panel. Has a fold down tower for ease of installation and transport. Product Description: The ValueLine pallet wrappers are designed to meet the most cost effective pallet wrapping applications. The function of the machines is to easily and effectively wrap pallets with palletized goods on them, secure enough for transportation. Ideal for low volume users in all industries. Easy machine set-up for first time users and simple and easy to use control panel. Has a fold down tower for ease of installation and transport.